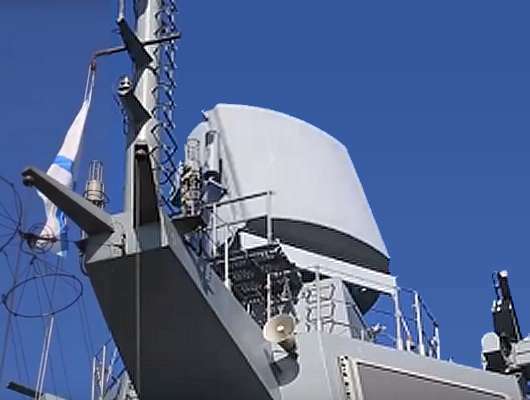 The 5P27 “Furke” (kyrillic: 5П27 « Фуркэ ») is an operating in E-Band naval 3D pulse-Doppler volume search radar for detection, tracking and targeting of air and surface targets. The antenna is a passive phased array during transmitted pulse that is provided by a klystron. During receive time, the antenna is an active antenna with digital beam forming of three independent antenna patterns stacked in elevation. The radar is a shipborne variant of the battlefield air surveillance radar 1РС1-1Е (1РЛ123-Е) of the ground-based anti-aircraft missile and artillery complex “Pantsir-S1”. There are now four versions known.